Organisations promoting civic education in the Arab world often face difficult working conditions. Connecting MENA NGOs with one another, and with NGOs in Europe, helps spread expertise and resources. In the aftermath of the Arab Spring, many MENA countries that saw popular uprisings or protests have in turn witnessed counter-revolutionary reactions. The traditional powers-that-be have tried to reassert their positions, clamping down on freedom of expression and association. Moez Ali, a seasoned fighter of corruption in Tunisia and an NGO activist focused on human rights, is blunt when he describes the political dynamic. “Regimes in the Arab world would like to have subjects; they don’t want citizens who are informed about their rights." I was surprised to find that many young people [in Germany] do not feel how political participation is important. Ali, and many other civil society activists in the MENA region, are meeting the challenge head-on. The vision? To participate in implementing sustainable democracies, where citizens can live freely, have freedom of speech and play a full participatory role. 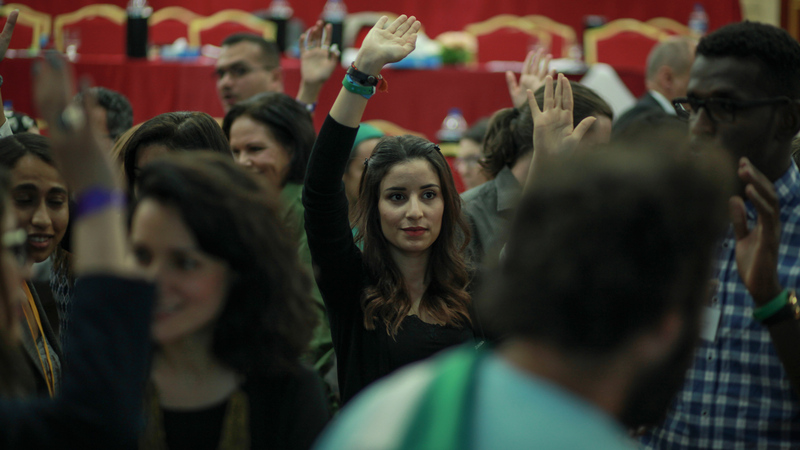 A number of initiatives have been launched by the Goethe-Institut in recent years to bolster civil society in the MENA region, including two civic education conferences (CEC), in Alexandria in 2013 and in Hammamet in Tunisia in 2016, organised in close cooperation with the German Federal Agency for Civic Education. One outcome from the 2016 conference was the official launch of the Networking Arab Civic Education (NACE) organisation. This connects NGOs both within the Arab region, allowing them to share resources and expertise, and with their counterparts in Europe, recognising that certain problems – such as migration and radicalisation – are shared by both the north and south Mediterranean countries. These developments come as many citizens in the West – in the EU and in the US – are growing aware that the democratic culture in their own country is not guaranteed, but can be eroded by populism and nationalism. It also connects Arab NGOs with organisations in Europe, including NGOs in Eastern Europe, where countries made the transition to democracy after 1990, which can provide insights into lessons that were learnt as part of that process. The network is also a powerful advocacy tool for the importance of civic education, says Louisa Slavkova, a founding member and director of Sofia Platform, a Bulgarian organisation that promotes democracy.